SINGAPORE - Construction work on the first 60km of a 150km continuous green trail that will go around Singapore will start at the end of the year, in an ambitious project to enhance connectivity and create new recreational spaces for cyclists and park goers. In a ceremony on Saturday (July 9), Prime Minister Lee Hsien Loong planted a tree at the Sengkang Riverside Park, commemorating the start of phase one of the Round Island Route, an idea conceptualised in 2011. The 150km corridor, which is more than three times the length of Singapore, will be built in three stages. While a completion date has yet to be announced, the route will link up existing natural, cultural, historical and recreational sites when finished. Expected to benefit about 3.5 million residents along the route, the development is part of the larger Park Connector Network (PCN), which is already 300km in length. The National Parks Board (NParks) will be calling for a tender in the next few months for the first phase of the route, with construction works expected to start at the end of the year (2016). The first 60km stretch, named the Coastal Adventure Corridor, will start from Rower's Bay at the Lower Seletar Reservoir Park, passing along the coasts of Punggol, Pasir Ris, Changi and East Coast Park, before reaching Gardens by The Bay East. Ms Kartini Omar, group director of parks development at NParks, said efforts have been made so the Round Island Route has "seamless connectivity". 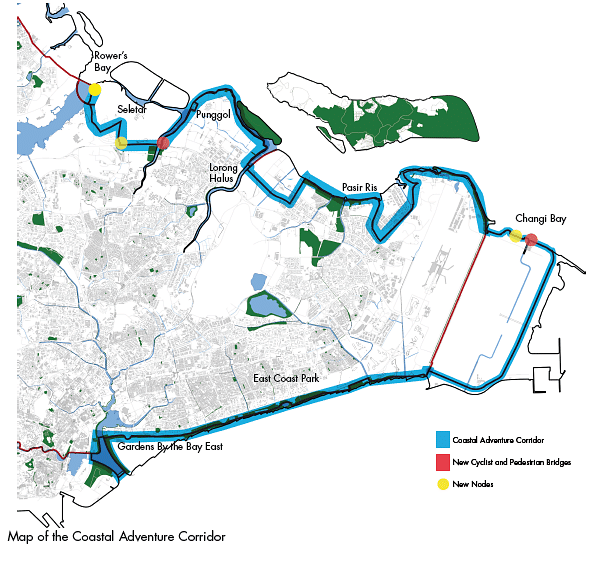 "For the Coastal Adventure Corridor... we will have a bridge across the Sungei Punggol, which will link the two parcels of Senkang Riverside Park, so park users (cyclists) don't actually have to dismount and (can) have a more seamless ride," she said, citing an example. The Round Island Route's tracks will be mostly 6-metre in width, wider than the 4m paths at the park connectors. It will also have shelters, toilets, lookout points, information kiosks, bicycle parking lots and self-help bike repair facilities.